Today’s guest picture comes from my sister Susan. She was told by our brother Andrew that she might find an interesting house in Chiswick. This was it. As we are going to have a very long day in a bus going to Manchester to sing in our choir competition tomorrow, I had a very easy day today to try to get myself in good condition. My face has got a lot better over the week so I won’t look quite such a fright when I am standing on stage. This is a relief. I had a lie in after breakfast and finally got round to topping up the bird feeder after coffee. This stimulated a lot of action. But the nearest that a robin got to it was peeping out from behind a leaf some distance away. After a rainy start to the day, the weather cleared and there was even a little sunshine to encourage the birds. I rather think that the chaffinch approaching the feeder is more concerned about getting his photo taken than shifting the siskin. He certainly seems to be checking on where the cameraman is. The bridge repairers turned up early and poured some concrete in the rain. I don’t know much about concrete (I don’t know anything about concrete to be more truthful) so I hope that getting wet doesn’t bother it. You can see the ‘in’ and ‘out’ pipes on the pump in the picture and how close the bridge is to our house. After lunch, Mrs Tootlepedal went off to a meeting of her Embroiders’ Guild branch and I went for a short walk which included getting some snacks for tomorrow. There was not much in the way of views as the sun had gone in and it was rather grey so I kept my eyes down today. There were plenty of opportunities to look at mosses…. …and for once, the light seemed to be just right for looking at catkins and tree buds. The alder catkins are colouring up well. I liked this oak branch near the old distillery. There is some wood under all that lichen. The retaining wall on the far bank of the river looks as though it might need a little work. I crossed Skippers Bridge and walked back on the town side of the river. There is a fence on the way which had some good lichen on it last time that I passed and it was still looking good today. The yellow lichen is absolutely tiny and needed a really close look look. I did my shopping and continued home. When I was walking up Caroline Street, I noticed a quartet of ducks all having a siesta. And on my side of the river, a little patch of jewelled moss caught my eye. Just down the road from our bridge, there is a pile of concrete beams and I presume that these are going to make up the new bridge once the concrete has set. I walked along the dam and crossed it by stepping stone and went through the gate into our garden. As I went past the drying green a lone crocus stood out among the grass…. …though when I looked at the picture later, I saw that it was actually standing out in the middle of a lot of moss with hardly a blade of grass to be seen. Did I mention that it has been a very wet year? Looking up at the walnut tree before I went into the house, I could see a good number of starlings perched on the highest branches…. …and knowing that they like pink pellets, I put some out. In less than ten minutes, they had scoffed the lot. Three collared doves also visited us and I was quick enough to catch one today. Once inside, I settled down to catch up on the Winter Olympics and the rugby and in this way, the rest of the day slipped by. I did take time out to practise the songs for tomorrow and make some bread for sandwiches to eat during the day. We have got to get up not long after six in the morning tomorrow so it will be an early night for us tonight. I am not expecting to have the opportunity to post anything as we won’t get back until late. Not one but two flying birds today, both of them goldfinches, neither of them very good pictures. I couldn’t choose between them. Today’s guest picture comes from my sister Mary who was on my brother Andrew’s birthday trip at the end of last month. This is the Severn at Worcester. We had a beautifully sunny morning here. There was still a bit of snow around and as I had to go up to the Moorland Feeders to act as a fill-in feeder filler, I was a bit worried about icy roads and parked the car and walked the last section. ….but with views like this…. …it was a pleasure to be on foot anyway. It was easier to watch birds there and I was pleased to see the return of a brambling. It conveniently perched in front of a male chaffinch in the plum tree so that readers can get an idea of the similarity and the difference between the two. Then it politely moved on for an individual portrait. …and finally found a chaffinch and (the same?) brambling who were kind enough to find a little sunshine for me. The dam bridge repairers had got their pump going and had installed a pipe to take water over the works. They have set up a little coffer dam on the upstream side of the ex-bridge and when there is enough water behind it, the pump leaps into action and sends it over the road and on its way. After lunch, the sun disobligingly went in but Mrs Tootlepedal and I still went out. …. 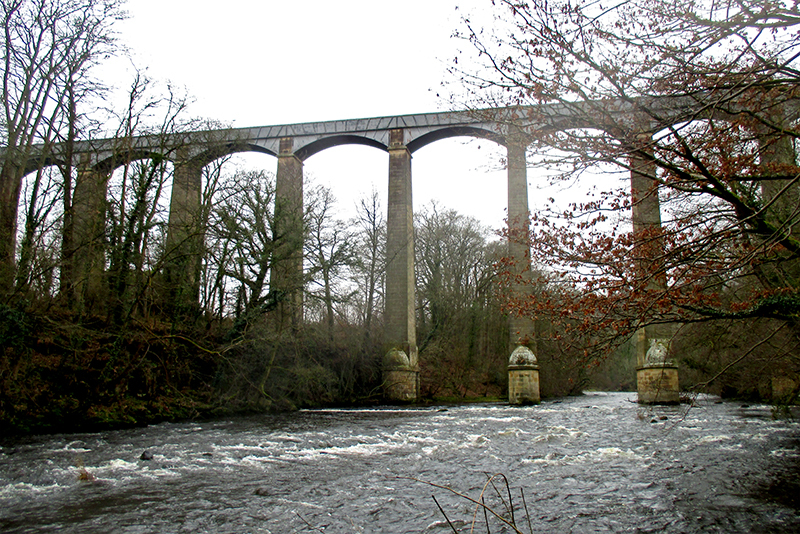 (where I could happily spend time poking about on another walk) and then along the path above Skippers Bridge…. …past all sorts of exciting things…. …until we got back onto the road beside the Esk. We passed a gate which has a very ornamental stone surround but no wall at either side of it. It must have been a meaningful gate at one time as we noticed that it has a benchmark engraved into its surround. I took the inevitable picture…. …and then we crossed the bridge and walked home along the Murtholm track, which is well supplied with catkins. …and finally, we went through the park and got home. After a cup of tea, we settled down for a quiet time. When the working party had gone home for the evening, I nipped out to check on the progress on the bridge. In the evening, Mrs Tootlepedal went off to the Buccleuch Centre for a screening of Tosca and I went to the Day Centre for the first meeting of the year of Langholm Sings, our community choir. Another tenor has joined the choir so I took the opportunity to sneak off and join the basses. I had a good time, particularly because I was sitting next to my cello playing friend Mike. He is an excellent fellow to sit beside as he is very musical and sings well. I could relax and follow his lead. On the minor injuries front, I can report good progress. My face has healed up enough to let me have a shave today. This was very welcome. Through the good graces of Photoshop, I managed to find a bit of colour on one of the chaffinches from this morning and he is the flying bird of the day. As you can see, the lawn is still covered with snow. Today’s guest picture is a snapshot of the weather in Manitoba. It was sent to me by Mary Jo. It makes even a very gloomy winter’s day in Langholm look toasty. As Mary Jo said, it provided an excellent excuse for a prolonged lie-in. These are degrees C.
Shakespeare posed the rhetorical question, “O, who can hold a fire in his hand / By thinking on the frosty Caucasus?” so although I felt a great deal of sympathy for Mary Jo’s deep freeze, it didn’t make our miserable day here seem any better. It was above freezing and much of the snow had melted but there was enough slush about to make walking an activity which required attention and the low mist didn’t make being outside attractive anyway. We had a quiet morning indoors and even watching the birds wasn’t much of a distraction as there weren’t many about today and the light was appalling. ….but there was no much point in wasting time with a camera. After lunch, we were promised a slight lift in the gloom and when it came, Mrs Tootlepedal and I went out for a stroll with a bit of shopping thrown in. The walking turned out to be less problematic than we feared and there were parts of the walk where the snow and slush had almost disappeared. A bright spot on a dark day was a burst of flame in the heap at the stables on the Stubholm. When we got to the Murtholm, it was almost possible to believe that it hadn’t snowed yesterday at all…. ….but a look up at the slopes of Warbla told a different story. We crossed Skippers Bridge for the last time in 2017…. …and I took the last photograph of the bridge for the year as we walked back to the town. ….but it was only a promise and it soon faded back to grey. We did our shopping and then walked home, happy to have had some exercise and to have met some friends on the way. The little Lumix which sits in my pocket when I go for walks is a marvel of technology but it has odd quirks and one that came to the fore today is its positive dislike of catkins. I saw some very chirpy reddish hazel catkins in the hedge while we were talking to a friend whom we had met on our walk so I got up close and tried to take a picture of them. The Lumix simply wouldn’t focus on them. It didn’t focus on anything else but just wouldn’t focus on them. It claimed it was focussing on the catkins but it was lying. There is just something that it doesn’t like about catkins. It’s a great mystery to me and I sometimes think that I have spent the best part of my later life trying to get a decent catkin picture. Fortunately, it is going to be a degree or two warmer tomorrow so we shouldn’t be troubled by frozen slush but unfortunately, it is going to be wet in the morning and a lot windier in the afternoon so it looks as though 2017 is going to end in a way that will typify the whole year….with rotten weather. We are investing a lot of hope in a better year in 2018 as Mrs Tootlepedal has big gardening plans and I want some enjoyable cycling days. This was the best effort at a flying bird of the day that I could manage.